Here is the overture to "I Bertolt Brecht." I like to call it "Big Little Symphony." I started writing it a few years ago just for fun, in the style of composers like Hindemith, Honneger, Prokofiev and Shostakovich, etc., who wrote rather noisy, spiky, brash, "modernist" orchestral pieces during the 20s and 30s. This sort of music conjures up, for me, the inter-war period in Central Europe, the world of Brecht and his collaborators Kurt Weil and Hans Eisler. When I began thinking about doing this project, it occured to me that the "limping" rhythm at the beginning of the piece suggested the limping gait of Dulle Griet (Crazy Greta), the principal character in Breughel's great war painting. This painting was a particular favorite of Brecht's, possibly suggesting, for him, his own character, "Mother Courage," who makes her living by peddling her wares to soldiers on the front lines. Breughel's painting represents something almost inexpressible about war, madness, fear, death, struggle, fanaticism, pain, and, perhaps above all: irony. It represents something else as well, something about what it means to be a "political artist." 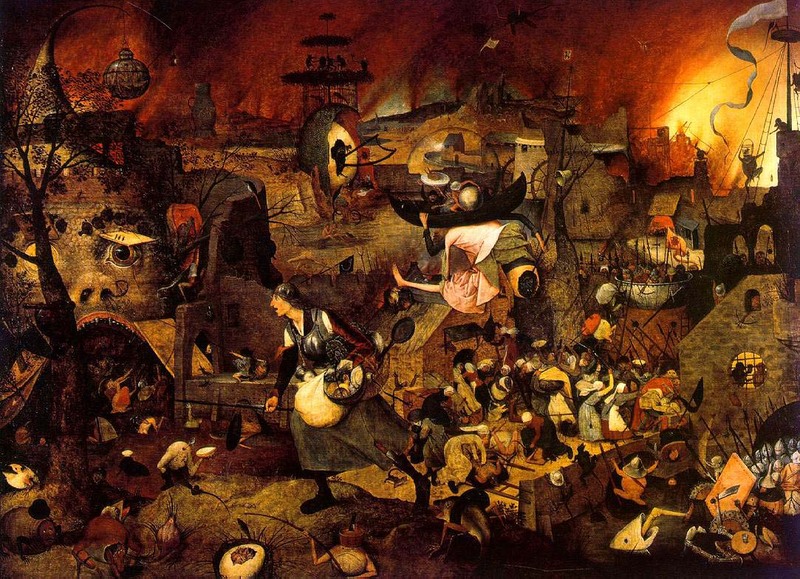 And certainly Breughel, along with Brecht, and also Brecht's good friend, George Grosz (also one of my favorites), was one of the great political artists. So, please, as you listen to this music, study the picture which, in part, and not entirely by design, it represents.